Eastern white pine is a large tree with a pyramidal crown when young, becoming flattened or broadly rounded with age. Leaves are needles, 3–5 inches long, in bundles of 5; slender, straight, soft, flexible, blue-green, undersurface of needles lined with white pores. Bark is green or gray, thin, smooth on young trees; becoming thick, brown to black, deeply grooved, with broad, scaly ridges. Twigs are slender, flexible, green becoming brown with age. Conifers do not technically "flower," but pollen is shed March–May. Fruits September–October, maturing the second year, persisting on the branches. Cones woody, in clusters of 1–5, hanging, slightly curved, cylindrical, 4–8 inches long, green turning light brown; scales numerous, thin, not spine-tipped, often with sticky resin. Similar species: Missouri has only one native pine species, the shortleaf pine (Pinus echinata). The other five pine species included in our flora (including eastern white pine) are non-natives that are commonly planted in timber plantations, for wildlife habitat, for erosion control, or as ornamentals: Austrian pine (P. nigra), jack pine (P. banksiana), loblolly pine (P. taeda), and scrub pine (P. virginiana). These species frequently produce cones and reproduce themselves within their populations, thus they can become naturalized locally and are counted as part of our state's flora. Other pines are grown only as ornamentals or on Christmas tree farms and do not reproduce on their own, so they are not considered part of our flora; these include ponderosa pine (P. ponderosa), red pine (P. resinosa), and Scotch pine (P. sylvestris). The bottom line is, unless you are at an old home site or at a place where the non-native pines have been cultivated and might persist on a local scale, the only type of pine you will encounter in the wild in Missouri is almost always the shortleaf pine. Height: to 100 feet; spread to 65 feet. Needles of eastern white pine are in bundles of 5 and are 3-5 inches long. Eastern white pine isn't native to Missouri. It reproduces on its own locally and around plantings. Eastern white pine has been introduced to our state in plantations for lumber, as a landscaping ornamental, and for windbreaks and erosion control. It reproduces locally in and around the areas where it has been planted. Eastern white pine is the tallest tree in the eastern United States. It has a straight trunk and horizontal branches. One row of branches is added each year, which gives the tree an attractive conical shape. Can be found statewide in and near landscaping plantings. 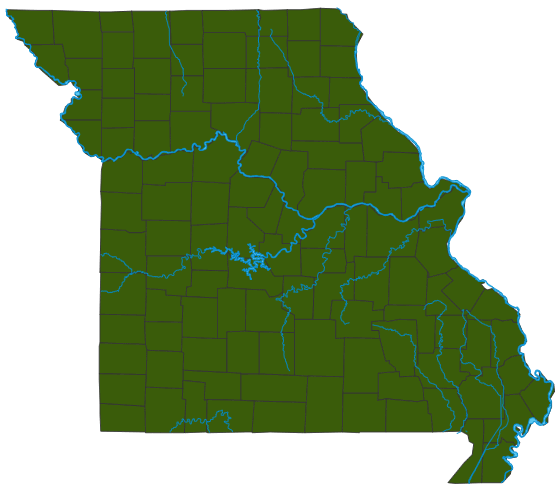 In Missouri, this species prefers moist, sandy loam soils. It is unlikely you will find an eastern white pine on a hike, unless you come across an old homesite where somebody planted it, or the trees that were its parents. Eastern white pine is not native to our state. It is native to eastern North America, in a range extending from Georgia north to Newfoundland, west to Manitoba, and south to Iowa; it is also native to some parts of Mexico and Guatemala. It has been widely introduced elsewhere, for it is one of the most popular lumber trees in the world. This species was crucial in our nation’s history. The tall straight trunks were prized for ship masts in colonial days, and a protracted battle with the English Crown over the use and ownership of America's stands of large white pines contributed to the uprising of the American Revolution. Although Americans used it to (quite literally) build America, destroying nearly all the virgin forests and ancient trees in the process, eastern white pine has always provided homes to birds and small mammals, many of which eat the seeds as well as dwell in its boles and boughs.